Name : believed to be Welsh - ‘by a different sea’. Various spellings of the name occur Aliumare, Lumare. Late Victoria ‘Boom’ style two story brick house rendered and painted. Originally had nineteen rooms and a curtilage of seven acres. The original inhabitant of the house was probably Thomas Wilson Garlick who was a coal and iron ore prospector and miner. He was associated with prospecting and surveying for the North Bulli Coal and Iron Mining Company from the mid-1870s. At various times, his fortunes were waxed and wanned and he was summonsed several times for outstanding debts. He married Mary Collaery on 8 June 1863 at St Francis Xavier’s, Wollongong. Mary was the eldest daughter of Thomas Collaery of Bellambi. The marriage had its moments and in 1878, Mary Garlick sued him for support. A warrant was issued for his arrest the following year as he had not provided the support. Garlick was a Justice of the Peace and often sat on the bench at the Clifton Police Court. He was also at one time chairman of the local school board and donated prizes for Empire Day. Quite a number of people are going to make a pleasure day of it on Wednesday next and have a trip to the great furniture sale at Aliummare (South Clifton). Sale will be conducted by Will. A. M'Donald, auctioneer, sale of furniture on behalf of T W Garlick. Thomas Garlick moved to Ashfield in Sydney where he died on 8 December 1901. Mary Garlick died at Bulli on 11 August 1906. The house was either already owned by Charles Gibson Brown or purchased by him soon after Thomas Garlick sold up. ALIUMMARE, situated at South Clifton, Extensive grounds of seven acres, villa containing, including in all, 19 rooms, Plentiful supply of water laid on, Electno bells throughout. Splendid Orchard and Garden. The whole property within 300 yards of the ocean beach. As a private residence or South Coast Tourist Resort cannot be excelled . For further particulars apply to C. G. BROWN, South Clifton. Brown was also involved in coalmining. 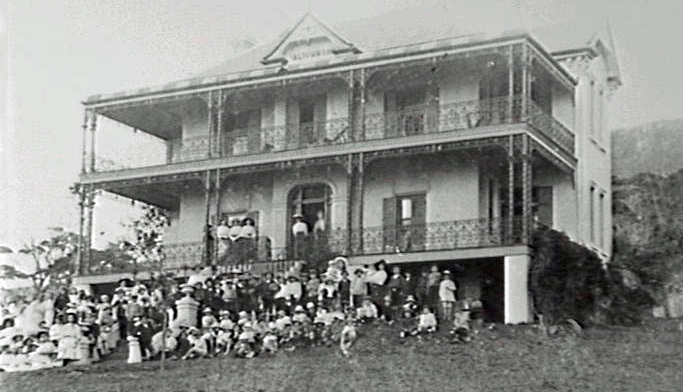 He died on 27 March 1909 and in 1912, his wife and family left Aliummare to live in Sydney. The house was let to a Madam I Kearns who ran a convalescent home there. Mrs Brown was back in the house by 1918 when her son, Charles, died in World War 1. 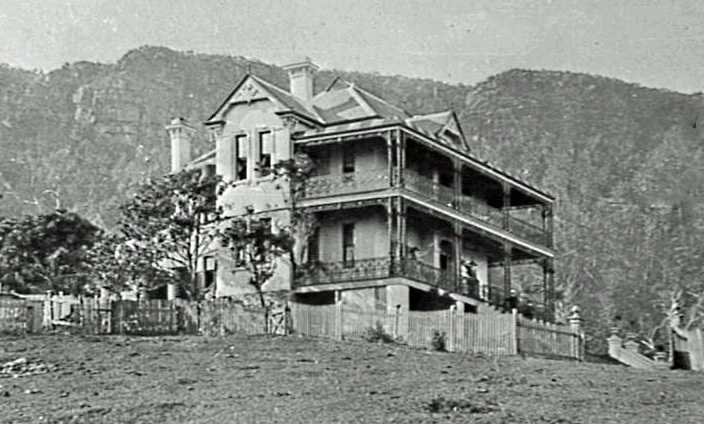 Mrs Brown died in 1942 and her death was registered at Bulli so she may have been living at Aliummare. An old Wombarra mansion, once the scene of an espionage intrigue, will be auctioned this month. Auctioneers will sell the estate of Charles Winston Brown - a house and about 1.2 hectares of property at Wombarra - on March 22. House was built in late 1880s and first occupied by the chief pay clerk of the old Scarborough mine shaft - a Mr. Garside. Resident J. Saywell quoted story of a Madame Kurtz who was caught sending coded message to a German ship in World War I. THERE'S nothing like a ghost story to add to the mystery of an old house and there's at least one such property in Wombarra. Newspaper articles of the day reported a Madame Kurtz, who had lived in Aliummare (also known as Aliumar and 'Lumere) in Morrison Ave during World War II, had been arrested as a spy. She was charged with treason after being caught allegedly sending morse code messages to German ships standing off the coast using an oil lamp from the top of the four storey home. Rumour has it that the house in which she once lived is now where her ghost appears from time to time. The lovely home, built in the late 1880s, is one of the few remaining examples on the coast of the architecture of the day. It will be a busy day for real estate agents in the Illawarra's north today with a number of properties going under the hammer. The highest profile of these will be the heritage-listed Wombarra mansion Aliummare, built in the late 1880s and meticulously restored to its former glory. The mansion, at 129 Morrison Ave, was originally built for the accountant of the Scarborough mine. The late Victorian "boom style" mansion was given the name Aliummare, which roughly means "by another sea" in Welsh. The two-storey home has a basement and attic and sits on a 2263sqm block. Simon Beaufils of Ray White Helensburgh said that, subject to decent weather, a large crowd was expected for the 12.30pm auction. He said there had been 120 inspections of the property during the campaign. Historical opulence will capture your interest upon entering this meticulously presented grand residence whilst attention to detail is obvious from the minute you enter the front door. Resting amidst enchanting landscaped gardens, this totally unique two storey grand residence enjoys an idyllic setting on an expansive 2,263sqm block. c1888, its striking interiors are graced with a wealth of exquisite original and restored features. Lovingly refurbished classical kitchen and bathrooms featuring hand painted timbers, marble, granite and stained glass windows are highlighted throughout. Modern luxuries like under floor heating within the travertine marble floor and superior kitchen appliances are integrated seamlessly into the original character of the home. In addition the completely rebuilt timber decks provide the perfect venue to enjoy the expansive ocean and escarpment scenery. Floor plan can be reconfigured to reflect your family's needs, from the current design including separate parents retreat/TV room and extra study or alternatively would suit 4th bedroom accommodation. French doors from many rooms lead out to a large wrap around ironbark verandah. Formal living areas boast traditional working fireplaces, 12 foot high ceilings and original floorboards, perched above an original sandstone cellar. Landscaped gardens and a level turfed yard which once was a tennis court provide ideal surrounds for the entire family. Yet to be mentioned but not forgotten is the inground pool to complete the activities for your guests after returning from the beach, which is only 5 minutes walk away. Capturing 180 degree ocean and escarpment views you will lose yourself while being just over an hour south of Sydney CBD , just 40mins south of the Sutherland Shire and 20 minutes north of Wollongong city. Treat yourself to an inspection today. Must be seen to be appreciated!